Haveli - A palatial house, made by the rich people. 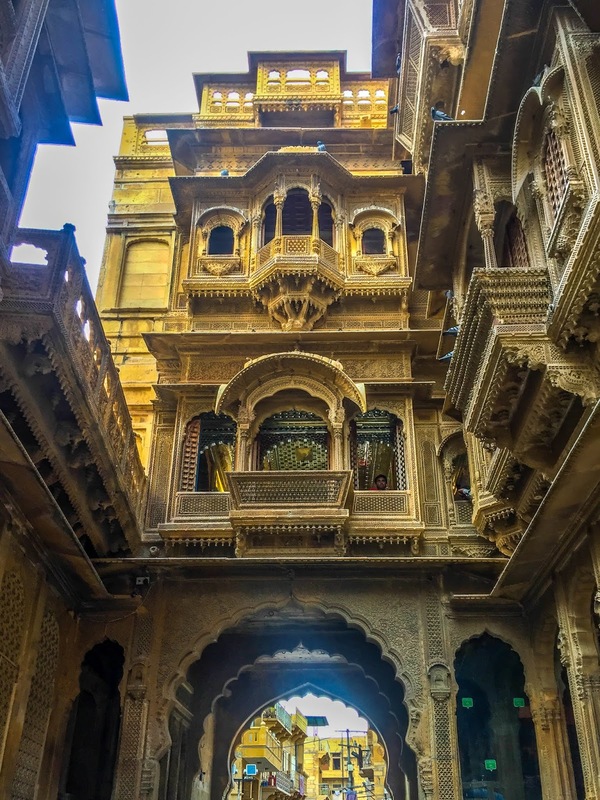 Jaisalmer has some ot the most beautiful havelis namely Patwon ki Haveli, Nathmal ji ki Haveli and Salim Singh ki Haveli. The most iconic of these is Patwon Ki Haveli. After meeting the guide the itinerary was finalised and it was decided that we will start with havelis today and keep Fort for tomorrow. So the first stop was Patwon ki haveli. The car can be driven quite close to the Haveli. This, in fact, is a cluster of five Havelis situated in a small Lane. 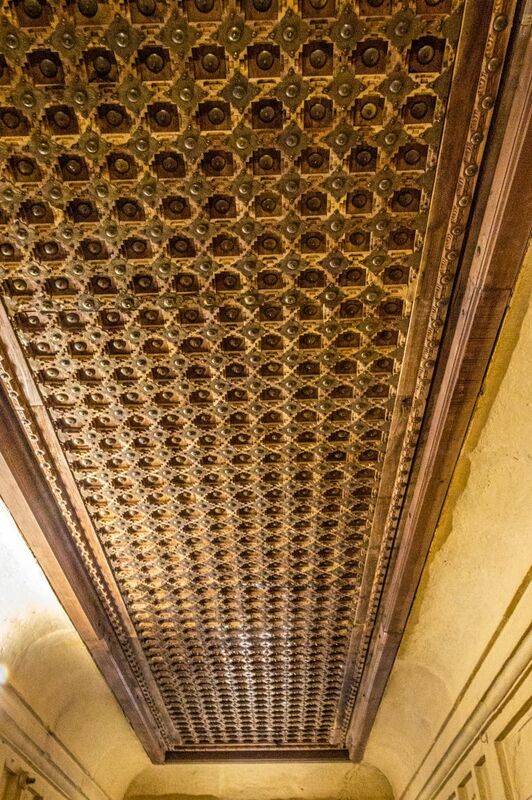 The very first glimpse of the Havelis makes your jaw drop in awe. 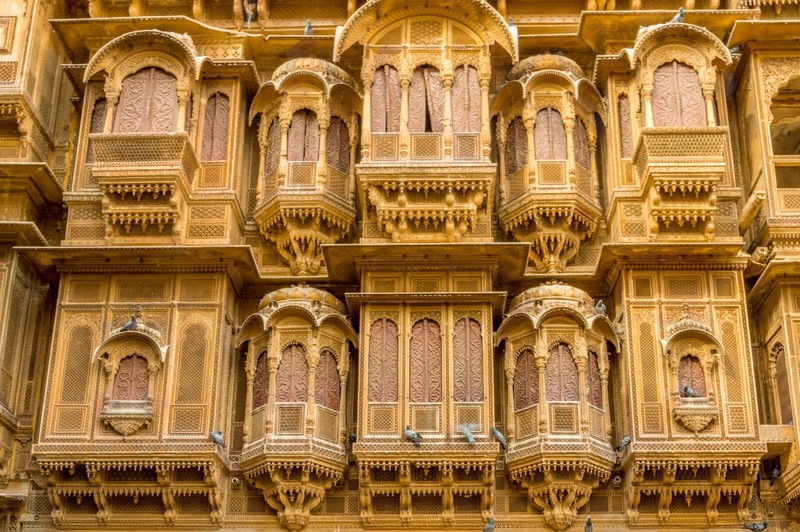 These Havelis were made up of yellow sandstone the trademark of Jaisalmer buildings. 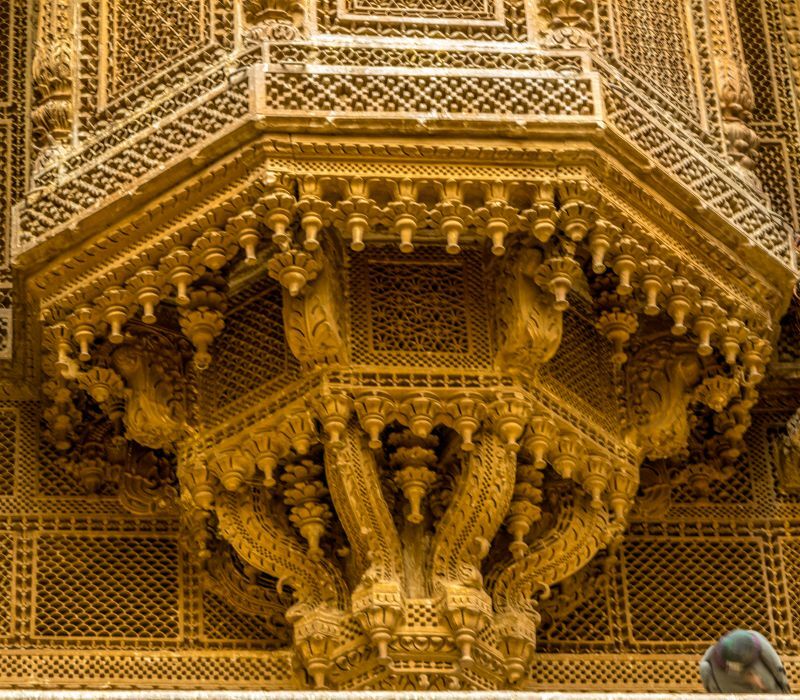 The balconies or the Jharokhas, as they are locally called, are so intricately carved that it seems unbelievable. Using simple chisel and hammer, the artisans, as if have carved a beautiful Sonata out of the stone. It took sixty years to complete these Havelis. 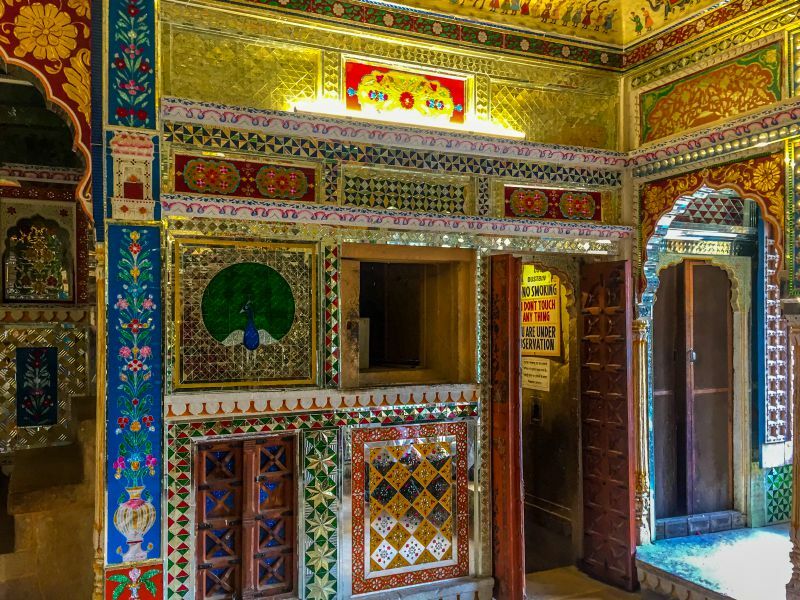 These Havelis give you a glimpse into the lifestyles of the rich people of Rajasthan. As discussed in the last post, Jaisalmer was an oasis on the trade route to Persia and Africa. Patwas were the businessmen at Jaisalmer and grew very rich owing to their alliance with the merchants passing through Jaisalmer. They used to deal in Silver and Gold Brocade, lend money to the merchants and also dealt in other things such as opium, gold, silver. Their trade flourished and they became so rich that they even started financing the State of Bikaner. During this period Guman Chand Patwa ordered these five Havelies to be made for his five sons. These Havelis took sixty years to complete, so Guman Chand Patwa could not see them completed in his lifetime. 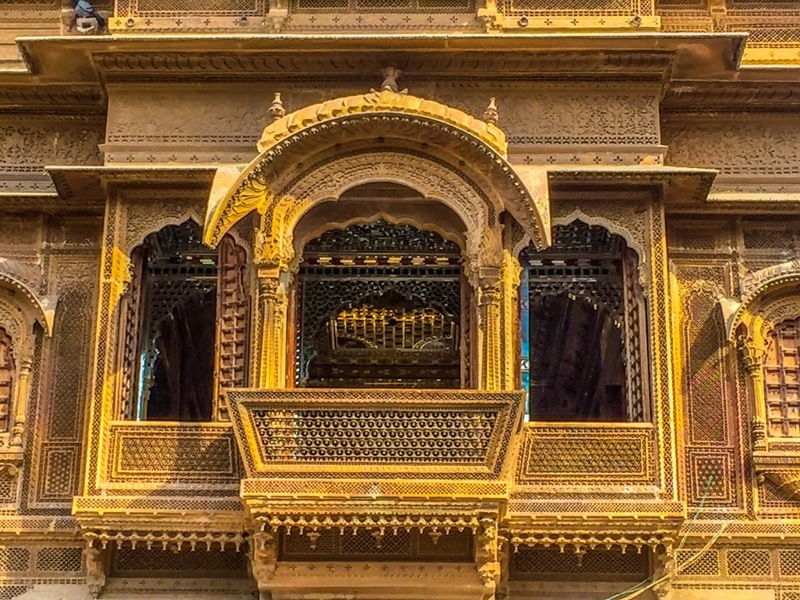 The Legend says that Patwas were advised by a Jain Muni ( Saint) to not to establish their business in Jaisalmer. So when they did so against the Saint's advise, their fortunes dwindled and they left Jaisalmer to establish business somewhere else. However, the more logical reasoning looks like that the downfall in the business and their reason to relocate was due to the opening of the sea route by British. The Goods started to move through ships, which were faster and could carry a much larger load in one go. So the trend of, caravans passing through Jaisalmer stopped, causing a dip in fortunes of the people involved in making money because of these Caravans. This forced the Patwas to relocate. It is also said that the real name of the clan was Bafna and Patwa was the title bestowed upon them by the king of Jaisalmer. 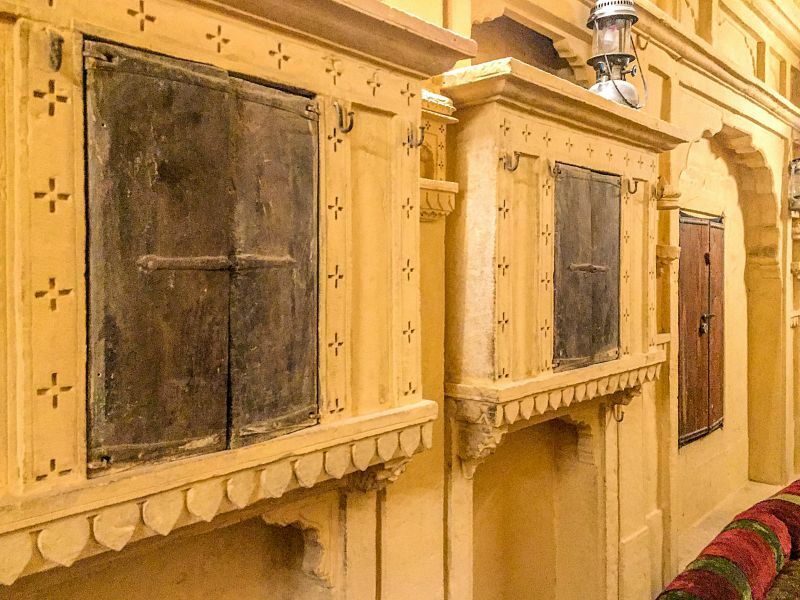 Once Patwas left, the beautiful Havelis were left to the caretakers. At one stage, these Havelis were about to be sold to some large business house to be converted into a hotel. 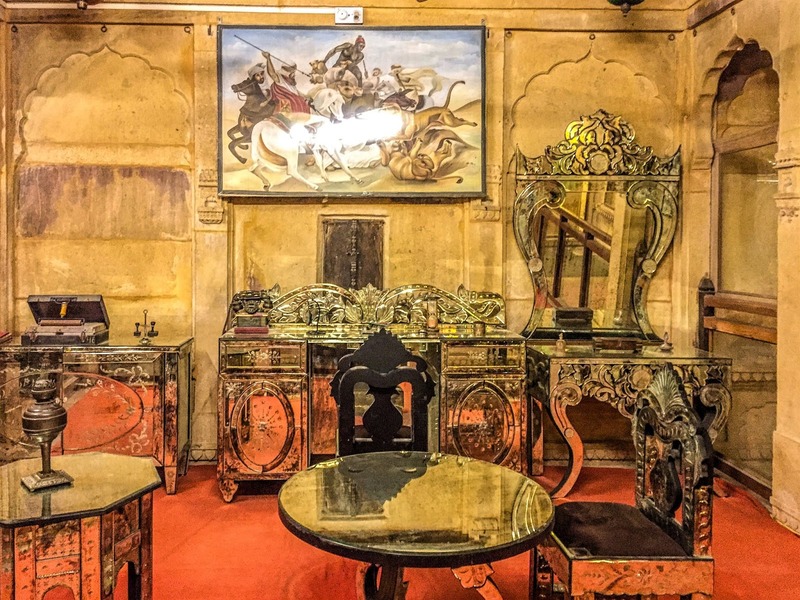 Then, another Marwari Businessman by the surname of Kothari stepped in to save the heritage and purchased one Haveli and opened it for the general public to visit. This is the most opulent of all the five havelis. Another Haveli is under the control of ASI. rest three are still under the control of private owners. 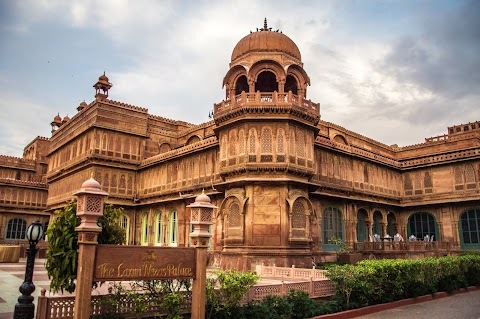 The architecture of the Havelis is predominantly Rajasthani Rajputana architecture and since the Patwas had business links with Persia and other countries, the effect of Persian architecture can also be seen. 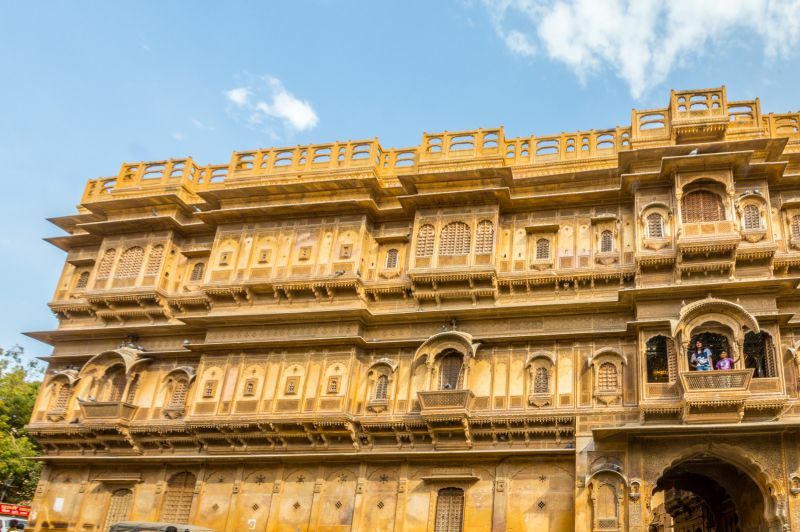 Since in summers, the temperatures in Jaisalmer can soar very high, so the floors are made up of mud and roof is that of wood, keeping the temperature of the rooms under control. 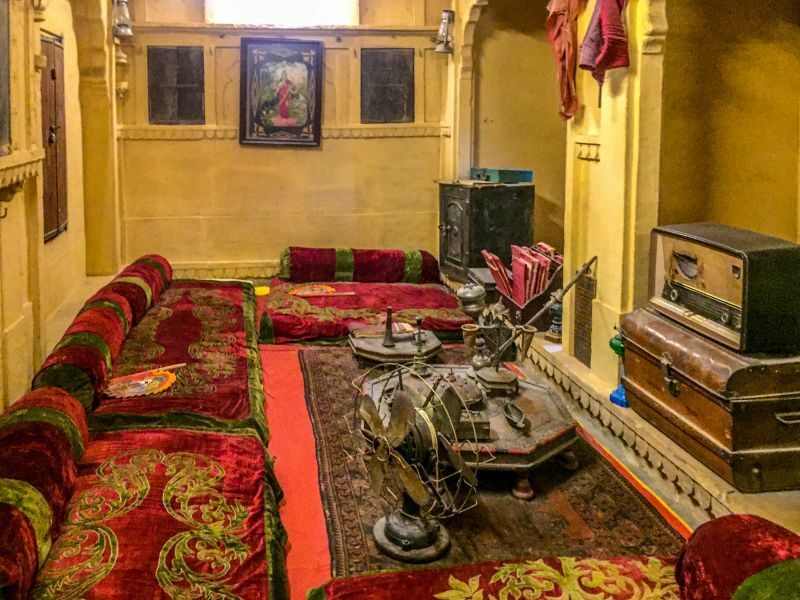 The Haveli also has a basement, which was used for storage, it has huge lockers which were built in the thick walls and were concealed by sliding huge stone slabs. The carving in the stone leaves you awestruck. 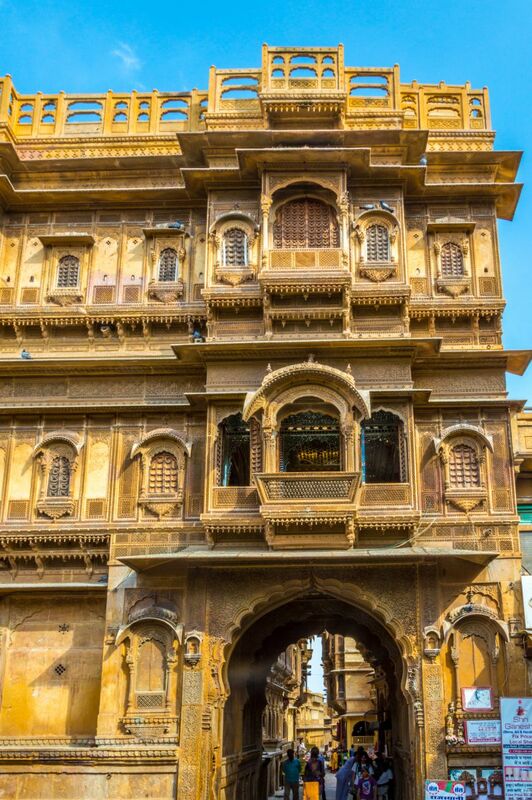 The most ornamental part is the Jahrokhas on the facade of the Havelis. The latticework, carving on the doors and stone leaves one awestruck. Imagining that the entire work has been done with simple chisel and hammer and no machinery has been used. From one side one can see 60 Jharokhas in one frame. 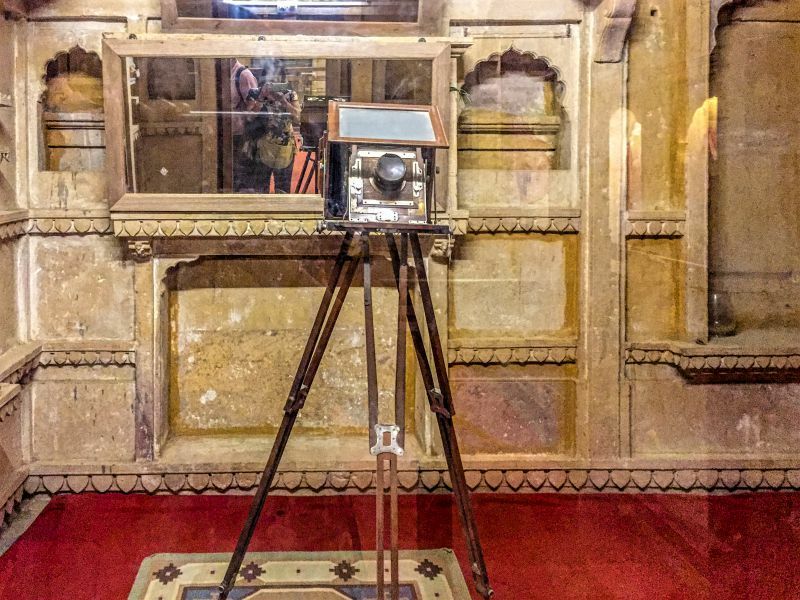 After being left wide-eyed by the beauty of the havelis from outside, when we went inside, we were in for a surprise. 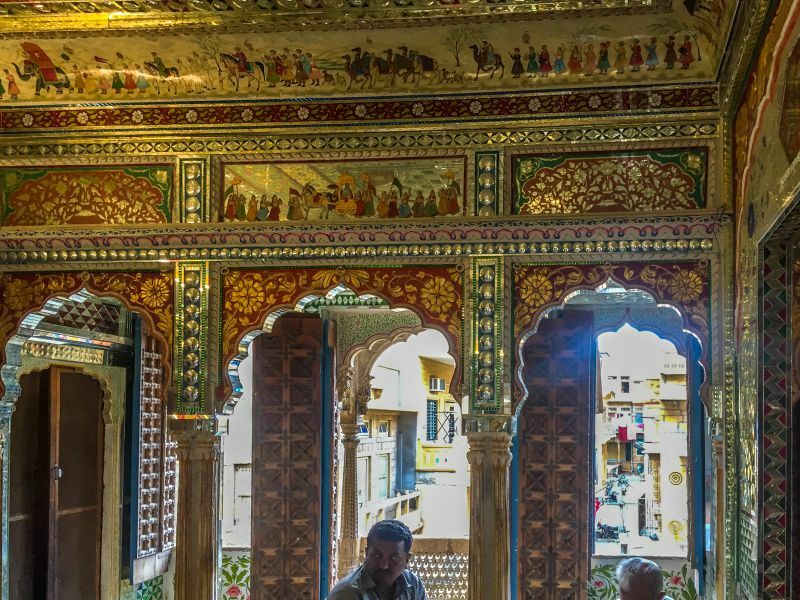 The beautiful murals painted on the walls, mirror work, gold plated ceilings and the beautifully crafted wooden ceilings left us astonished. 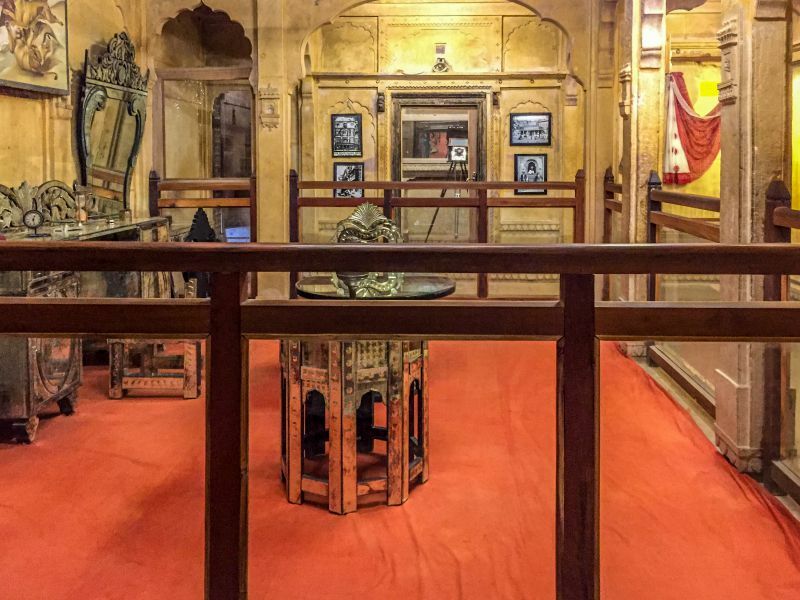 Some of the rooms of the Haveli have been converted into a small museum depicting the lifestyle of the rich. The stairs leading to the first floor of the Haveli are on the extreme right in the above pic. As we took that flight of narrow stairs, we landed in this room, which dazzled us with it beautiful Belgian glass work. Another pic of the same room. The beautiful murals depicting the lifestyle of the people of Rajasthan, The dazzling Usta work in gold, compliments the beautiful glass work. The intricately carved wooden doors at the background complete the picture of extravagance. First room and the most important room was Munim ji ka Kamra. In this room, Munims or The accountants used to sit. The room still has some old Bahis ( account books), a safe, an old painting of the goddess Lakshmi. The business and entertainment of the travelling businessmen was conducted here. Still the seals to authenticate deal papers, Hookah and an instrument to prepare opium drink are still there. A table fan and a Radio can also be seen. It is here the clients were received and entertained with opium, hookah etc. The lending of money and other business transactions were done here and the Munims recorded them in their bahis and issued notes of transactions. The side walls had Almirahs built in then and were used to store the Business documents. 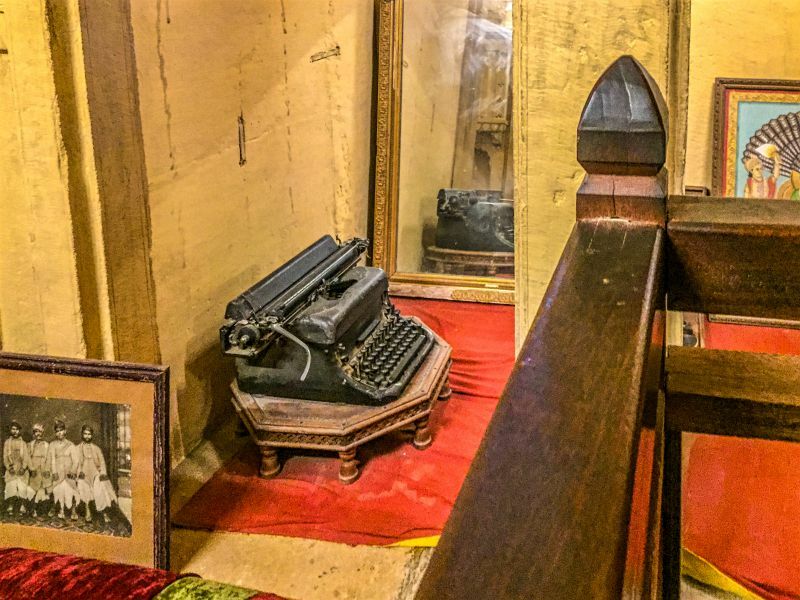 This room with opulent furniture might have served as The office sorts for the Patwa Seths, as it has a writing desk, a vintage phone, a dressing mirror, a round meeting table, some seals and a huge painting.